Perry’s Lily Ford drives up the floor past Indian Lake’s Lindsey Bodi during Monday’s game at Leonard V. Volbert Gymnasium. Perry’s Zierre Thompson shoots against Indian Lake’s Cheyenne Hill during Monday’s game at Leonard V. Volbert Gymnasium. See more photos from Indian Lake/Perry. 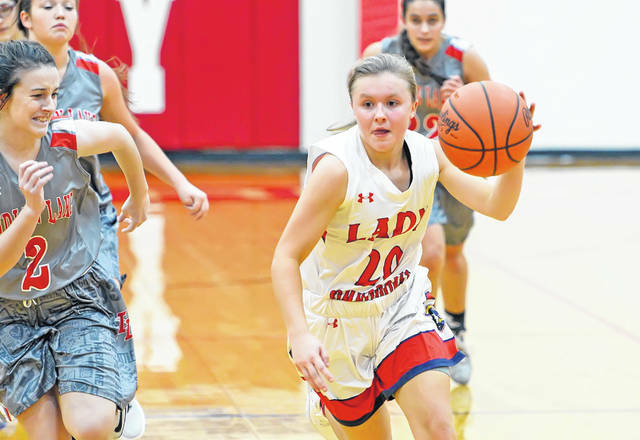 PERRY TOWNSHIP – With an abundance of underclassmen, first-year Perry girls head basketball coach John Berens is expecting some growing pains. In Perry’s season-opener Monday night, the Commodores went through some of those growing pains as Indian Lake’s defensive pressure and size helped pave the way for a 63-36 win over host Perry. Indian Lake (2-0) had three players score in double figures. Kaylee Shelton led the Lakers with 17 points and 12 rebounds. Kristen Young had 12 points and eight boards. Kaitlyn Boberg added 11 points for Indian Lake. Junior Tia Barfield led Perry (0-1) with 15 points and four steals. Teammate Makiah Denson added seven points. For the game, Perry turned the ball over 20 times. Eight first-quarter turnovers set the tone. Indian Lake started the game with a 6-0 run. Two early Perry turnovers resulted into quick transition baskets for the Lakers. Indian Lake pushed its lead to 19-5 by the end of the first quarter. Shelton led Indian Lake with seven first-quarter points. Indian Lake extended its lead to 37-15 by the halftime break. Kyleigh Huffer (nine points, three steals) hit three 3-pointers in the first half for Indian Lake. As a team, Perry was 6 of 21 shooting from the field in the first half. For the game, the Commodores shot a dismal 28 percent from the floor. Indian Lake shot 46 percent from the field. Perry won the third quarter 12-9. Indian Lake’s lead was 46-27 at the third stop. Indian Lake dominated the boards, 46-17.
https://www.limaohio.com/wp-content/uploads/sites/54/2018/11/web1_Perry-vs-IL-RP005.jpgPerry’s Lily Ford drives up the floor past Indian Lake’s Lindsey Bodi during Monday’s game at Leonard V. Volbert Gymnasium. 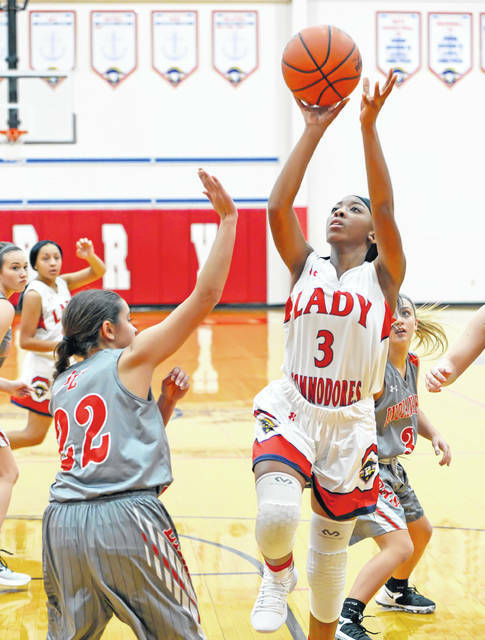 https://www.limaohio.com/wp-content/uploads/sites/54/2018/11/web1_Perry-vs-IL-RP002.jpgPerry’s Zierre Thompson shoots against Indian Lake’s Cheyenne Hill during Monday’s game at Leonard V. Volbert Gymnasium.